This latest technology in the digital dental field has what dentists need to pursue a desire for excellence in dentistry. It not only greatly benefits the dental patient, but it also creates the ergonomic support needed to help the dentist and dental staff avoid back, neck, and spine injuries that result over time from postures taken during current dental procedures. 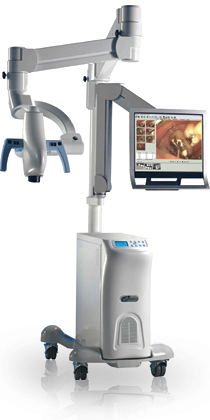 While sitting in a comfortable egonomic position, the dental professional works off a large LCD monitor, which produces clear, crisp images and allows the dentist to see more for quality patient care. The high quality lens offers advanced magnification – so much so that it is possible to see the fourth (4th) canal with no effort. The high resolution image, combined with direct light magnification, allows a more powerful view with no need for loupes or scopes. The DSS allows the dentist to be able to make more accurate diagnoses and perform more complex procedures while improving patient experience. Images are captured by a high quality lens that can be adjusted at any angle to better project the oral cavity as the reticulated arm moves up, down, sideways, or backward. Features like lighting, zoom, and focus are all controlled by hand from either the main unit control or the foot control. This latest in digital imaging allows the practitioner to save still digital images, record stop/start live streaming videos, or play back images. The images can then be saved to the Patient Database and used with no interruption for patient case presentation, teach and learning, legal records, and documentation or consultation. This dental equipment is able to connect to a large screen or the internet for Teaching and Learning applications. This high-tech dental equipment is for every dental application, including Diagnostic Procedures, Preventative Care Procedures, Restorative Procedures, Perio/Endo/Prostho/Ortho Procedures, Implant Procedures, and Cosmetic Dentistry Procedures.